16 km. northeast of Draguignan by D562. Head toward Grasse for 11km. then left on D225. 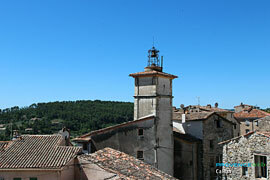 At 400 m. altitude, Callas is a picturesque village with houses of character, tall and side by side. . 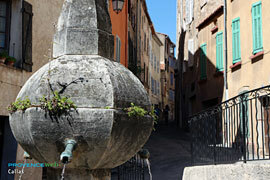 The narrow mounting streets will guide you to charming shady squares. As you stroll through, you will notice many ancient fountains, arcades, and 18th c. doors. The white bell tower, which is very tall can be seen from far. It is in the center of the village in a pleasant square. 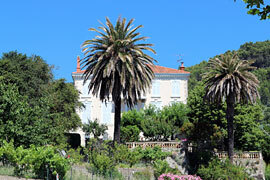 Callas is surrounded by wild and rocky lands and a great forest out of which emerges the Chapelle de Pennafort. This chapel is worth your visif as is the Chapelle Ste. Auxile which is perched atop another hill. The Greco-Byzantine dome, and Saracen tower of the Chapelle de Pennafort. 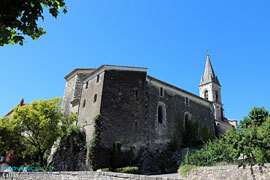 Chapelle Ste. Auxile (12-13th c.). Classical musical festival at the end of July. 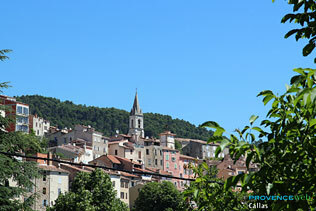 Bargemon (6 km), Figanières (5 km) and Seillans (20 km).